Shipping books overseas would be cost-prohibitive, not to mention take a long time to reach you! Never fear, you can still access library books - by reading them online! WSU Libraries has thousands of eBooks in the collection, which can be read on nearly any device. 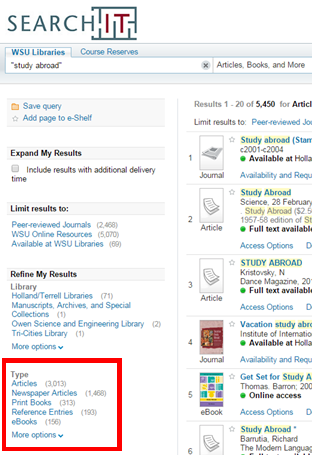 eBooks are found in three different databases, and can be discovered through Search It (see the box on the right for search tips). Each publisher sets their own limits on how much of a book you can download and keep (usually a certain percentage or number of pages of a book), and for how long you may check it out. This can range anywhere from a few days to a couple of weeks. See this guide for more basic information on getting started with eBooks, setting up free accounts with the databases, and downloading sections of a book to keep. Use this guide to learn about checking out eBooks, downloading chapters and sections, and get more information about device capabilities. 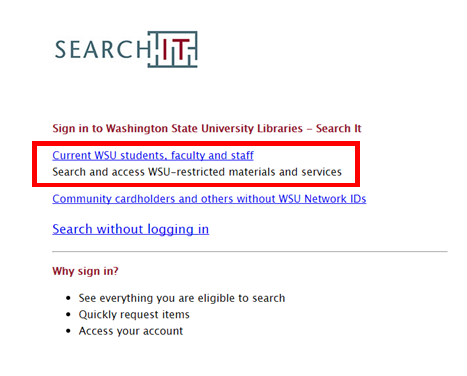 1) Go to our homepage at: libraries.wsu.edu. In the center search box, type your keywords or key phrases (if you are using a phrase like "study abroad" - more than one word - put it in quotation marks). DO NOT type your entire research question. Only focus on the KEY words. Click "Search." If you ever run into any problems, click on the "Ask Us!" button on this page. 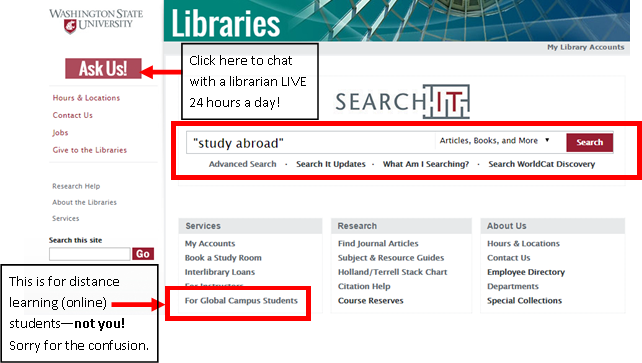 Here, you can chat LIVE with a librarian 24 hours per day (handy for those in a variety of time zones! ), and also email us. 2) Login using your Network ID (firstname.lastname) and password. This is the same as what you use for your email. 3) On your results page, look on the LEFT side of the screen. Under "Types," click on "eBooks." If you do not see this option displayed, click on "More Options" and then include "eBooks." 4) Once you find a result that fits your topic, click on "Access Options." A menu will appear that contains the link to the database that holds your eBook. In this case, it is ebrary Academic Complete. For some of the databases, you will have to create a free account in order to download or checkout books. For more information on how to do this, click HERE.